I’ve given Prichards somewhat of a bruising with my indifferent reviews of the Fine and the Crystal, but let me assure you that the Private Stock is quite a leap forward: because while the others were essays in the craft, this one got it absolutely right. Prichard’s company website entry for their own supposed top-of-the-line rum is massively unforthcoming, if not outright unhelpful. I mean, here’s a rum I want to write about with enthusiasm and knowledge so as to inform the readers, share my wonder, and yet a key data point is missing – how old is the thing? Perhaps I should be grateful that we do have the following: pot still rum, made from the same Louisiana Grade A Fancy molasses as the other Prichard rums, in an effort to recreate the colonial style of rums as they were made back in the day; aged in charred 15-gallon new white oak barrels; and ⅔ lossses to the angels were sustained. Based purely on these facts and the way it tasted, I’m going out on a limb until Prichards responds to me, and suggest the rum is a ten-to-fifteen year old. Oh, and it has a nifty bottle quite different from the other rums in the lineup, again to separate it from the crowd. And separated out it should be, because while none of the lingering suspicions I have about them loving bourbon more than rum have been allayed, I put all such notions aside: things started swimmingly from the moment I poured the amber rum into a glass and took a snoot. It had a billowing, solid, fruity nose. Again that cheese and crackers scent I seemed to find in all three Prichards tried so far (and that’s a brie, by the way, not a cheddar); warm and easy-going, with the 45% strength well tamed. The molasses were held in check and presented as a burnt sugar and light anise smell, not anything raw and unrefined; sugary notes emerged, vanillas (again, quite restrained), with some unidentified fleshy ripe fruits lurking, unidentified, in the background. Raisins, maybe, and some dark ripe cherries. I liked the taste as well. It was warm but not hot, powerful as the contents of a Transformer’s trousers, smooth and very well balanced. Here the fruits that the nose suggested were allowed to shine – blackcurrants, blackberries dusted with sugar and doused with the slightest bit of zest; and also plums, dates, figs, cinnamon, rosemary…with smoke, and leather and oak flexing their biceps at the back end, without trying to take over the joint. Complexity and balance which the Fine (and the Silver) had failed to do, were achieved with grace here. And the finish did not disappoint – the 45% was really the right choice for the Private Stock, and while there was nothing new to introduce in terms of taste and scent and last lingering notes, the aforementioned harmonies did not tear themselves to shreds and go off the reservation, but died with a sort of slow voluptuous sigh that left you with great memories and the desire for another sip. Over the years, I have not had that many rums from US producers that enthralled me, and to some extent that has made me somewhat cynical about what is being made over there (not least the stubborn fixation with 40%). We are so accustomed to industrial American rums that exist only as middling-quality liquid conduits for social diversion, that it comes as something of a shock – a pleasant one to be sure – to find one in which the simplicity of its construction, the balance of its components and the tastiness of its content, makes a statement for itself. That’s no small feat, and is the reason why I think it’s a really excellent product, deserving an unqualified recommendation. This rum will give other craft makers a real run for their money. It’s that good. Afterword: As I was editing this review for final posting, I lost patience with emails, picked up the phone and called Prichards directly, probably waking somebody up in the process: the very pleasant lady who answered told me without any waffling around that the Private Stock is a blend of rums aged 12-14 years. Neither attempt — to make an ersatz agricole (from molasses) or a white mixing agent to take on the more established brands — really works. 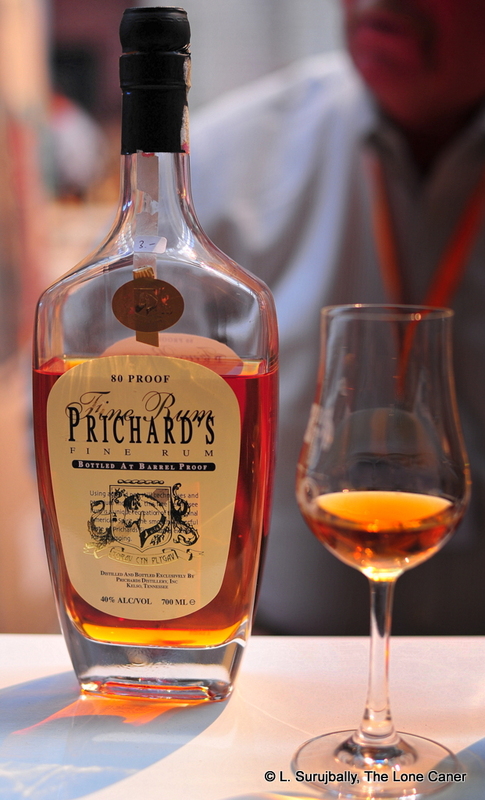 Prichard’s is that outfit from Tennessee which has been quietly and busily putting out rums for nearly twenty years, ever since Phil Prichard decided to make rum in whiskey country. And while it is now common for new entrants to the market to sell white unaged rum from their stills to cover startup costs and provide cash flow while they wait for more favoured stocks to mature, Mr. Prichard didn’t do anything of the sort, and so his white rum – called Crystal – came later to his company’s portfolio (the first review I’ve seen is dated around 2007). White rums (or “clear” or “silver”, or “blanc”, pick your moniker) come in several varieties, to my mind: agricoles (of which clairins are a subset), cachacas and white mixers, with a new field of unaged pot still whites beginning to gather a head of steam. The question to me was which target the Crystal was taking aim at, and if it succeeded at any. The evocatively named rum is apparently distilled five times using the same sweet Louisiana molasses as the Fine Rum, which is a major selling and marketing point for the company; it is unaged and comes straight from the barrel (though I’m curious – if it was utterly unaged, what was it doing in a barrel in the first place, but never mind). Anyway, one thing I remarked on right away after pouring it out, was a certain clear crispness to the nose. No real complexity here: green apples and vanilla for the most part, and remarkably sweet to smell: the origin molasses were detectable in spite of the filtration. The vanilla was really quite overpowering, though, even if some cream and saltiness emerged at the back end…overall, nothing too difficult to tease out. Even at 40% it kinda grated on the palate: it was sharp, too raw – that was the lack of ageing making itself felt. It wasn’t precisely light either, and the initial clarity of the nose dissipated early, to become a slightly heavier, oilier drink. When it opened up, other, less appealing tastes stepped up to show themselves off – still a lot of sugar and vanillas, yes, but also harsher iodine and metallic notes, with some crackers and brie teasing the senses without ever taking centre stage. And it was oddly dry as things wrapped up, with those vanillas and fresh-cut green apples returning to take a last look around before disappearing in a short finish. I review all spirits as if they were meant to be had neat – right or wrong, that’s my cross to bear in an attempt to use the exact same methodology to evaluate every rum I try. To have different techniques in evaluating different rums based on any idea of what a rum should be used for (sipping drink, cocktail ingredient) is to introduce a bias, if not outright confusion. 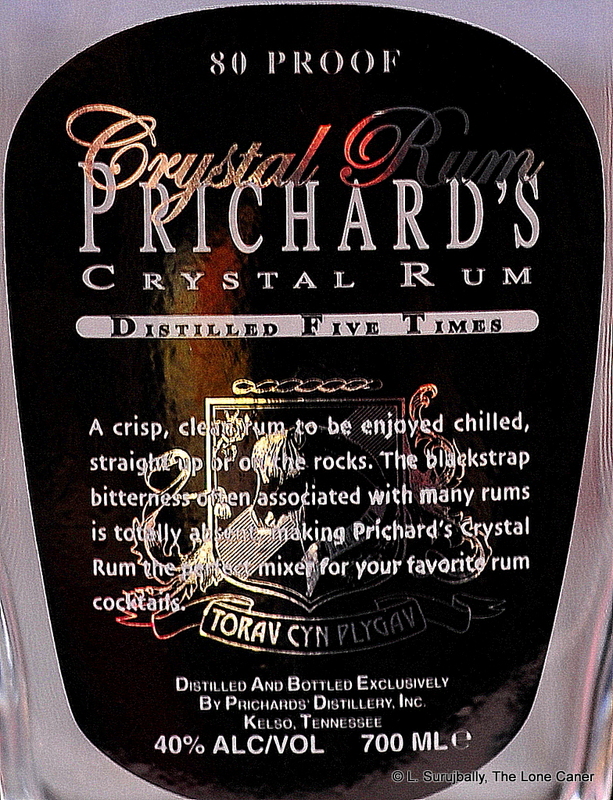 So by the standard of whether it works as a neat rum, then, the Crystal doesn’t succeed (and even Prichard’s website doesn’t imply otherwise and plugs it as a mixer). The very slight acidity of the fruit I tasted, mixed up with the lingering molasses, the vanilla, the jarring metallic notes, creates a discordant taste profile which destroys the sipping experience. As a cocktail ingredient, then? Probably much better. Not with a coke though – something sharper is needed to take the vanillas off, so I’d suggest ginger beer, lime, Angostura bitters, something in that direction. Prichard’s own website gives some examples. Since I’m not into tiki or cocktail culture, such white, bland, filtered rums don’t do much for me, and that’s why in over five years I’ve reviewed almost none (I’ve gotten hammered on them quite often, mind you). This one’s okay, I guess: it’s just a sweet-molasses-based silver, lacking sufficient complexity or blending artistry to make it as a solo drink. My low score should not be seen as a blanket indictment, then, since its failure as a neat sample does not invalidate it as a cocktail ingredient where it may shine more. I’ll leave it to experts in that field to argue the case for the Crystal, which unfortunately I myself could not and cannot make. A paradox of the mid range: a pot still rum that fails at very little…except perhaps excitement. I’ve been writing and rewriting this review for almost three months: each time I came to grips with it, I thought of something else to add (or delete), or some new and interesting product eclipsed the Prichard’s and made me want to publish that first. There’s a lesson in there somewhere, maybe. Prichard’s has been in business since 1996 when they became the first new distillery in Tennessee since the 1940s and have quite a stable of output, including some interesting rum products to their name – they produce three real rums, one spiced rum, three flavoured rums….plus six whiskies and five liqueurs. So, as with many such outfits in the ‘States, I occasionally wonder if their love isn’t primarily given elsewhere and they make true rums only in order to branch out a little. However, the website and interviews suggest the opposite, so maybe I’ve got it wrong. And I don’t mind that…I’m just curious about it. Small companies making rum in the USA sometimes try to recreate the American rums of yore by varying their input or production methods. In this case, Prichard’s use not blackstrap molasses (the black sticky residue after most of the sugar has been extracted), but sweet Louisiana Grade A molasses, of the sort that could be put on your pancakes the morning after. The rum is then aged for four years in fifteen-gallon barrels of new oak (another point of departure from more traditional techniques) Whether that works or not is up to the individual. I don’t think it’s all bad, just not something I’d remember enthusiastically a week from now either. It somehow results in a symphony of ho-hum in spite of some off-kilter moments. Perhaps starting with the aromas might make the point clearer: initially the amber liquid as decanted from the squat long-necked bottle presented clearly, with chocolate and toffee leading the fray. A little patience, a drop of water, and spices began to come forward – cardamon, fennel, apples, a cherry or two, and sly twitch of lemongrass for zest – before being blattened into the ground by a ridiculous amount of emerging iodine, leather, caramel, burnt brown sugar that dominated the nose from there on in. The rum was medium bodied, neither fierce nor fawn. It slid smoothly on the palate, just a little bit of burn from the standard proofage. I dunno, it seemed diffident, good ‘nuff, like a Three Bears of a rum, neither too much or too little. Again mocha and dark chocolate, coffee, toffee. And after it opened up, black grapes, overripe apples, more iodine, and a thin kind of vanilla thread through the whole business, with anise, molasses and caramel really taking ownership at this point and carrying the whole experience through to a lacklustre finish with just more of the same — unexceptionally so, in my opinion. 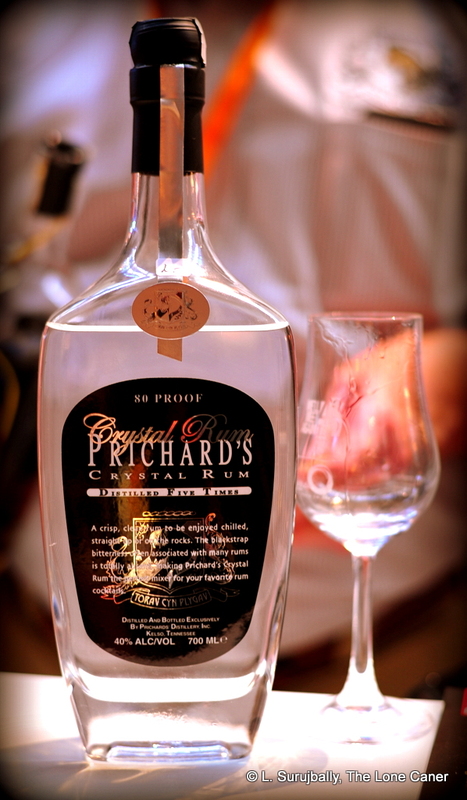 That grayness of my opinion has to do with the fact that while the Prichard’s Fine Rum is a workmanlike product by any standard — competently made and reasonably executed — it doesn’t have that extra edge of oomph that excites. It lacks any single shining point of distinction or originality upon which I can hang my hat and say “this part is freakin’ great,” hence my continual suspicion, however unjustified, that bourbon is what they really want to be making, and rum is an indifferent afterthought. Still…that it’s a drinkable, even sippable rum, with perhaps a shade too much Grade A hanging around in there, but worth the outlay — that’s all beyond dispute; it’s the question of whether it’s a must-have that’s is a bit more open to doubt.